Car owners know there shouldn’t be any noises from the steering wheel when making a turn. When there are, it can mean there’s a problem in the steering and suspension systems of your car. Putting stress will just wear the parts more and cause more rubbing or groaning sounds. These sounds can be signs of a serious problem so they shouldn’t be ignored. The two systems work together to let the steering wheels turn your tires, so ignoring them can cause trouble. If your car makes creaking noise when turning, this article will tell you why. And hopefully, it will help your car run as smoothly as it did before. When your car makes noises when taking a turn, lubrication is a good fix. But, it’s just temporary and will still fail eventually if you don’t look for a permanent solution. For this, you might want to check the suspension or the power steering system. 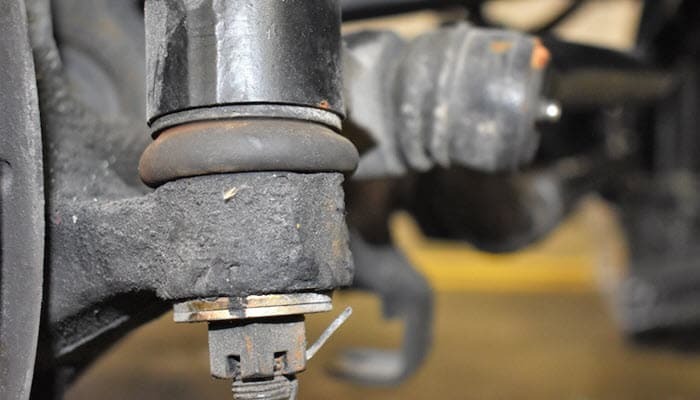 Clunking, popping, or creaking sounds can mean a worn-out or broken suspension joint. Since it carries your car’s weight and endures impacts on the road, it’s expected to wear out with time. In a damaged joint, you hear sounds since the connecting point is scraped by the suspension components. Meanwhile, a damaged power steering pump is the cause of a whining sound. As long as the noises come from the front of the engine, the pump is definitely the culprit. Screeching, squealing, and whining sounds when making a turn is the result of bad parts. If these happen, a part of your power steering system is probably damaged. A loose belt and a low level of power steering fluid are minor problems and can easily be fixed. However, the power steering system can be a complex system. It has a belt that drives the pump in front of the engine, hoses that create a bridge between the gear and the pump, and a tie rod that links the knuckles (attaching point of the wheels) and steering gear together. These parts wear out, break, or crack with time and noises are signs when these happen. So, it’s a must to take your car to a service center when you notice something weird. 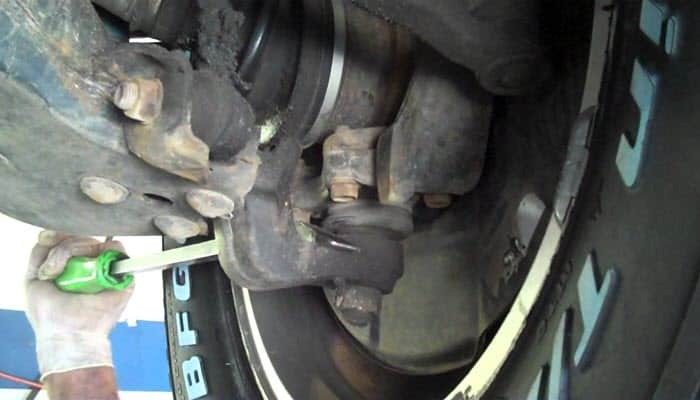 You need to check with the differentials, bearings, or CV joints when this problem occurs. Crunching or clicking sounds means there’s a problem in the CV joints. Bad coupling might be the reason your car is making noises when making a tight turn. On the other hand, the bearings carry the load when your car shifts weight when making a turn. So if what you hear is more like humming noises, check the wheel bearings. Ignoring this can make your tire wear uneven. In worse cases, it can create a wobbling wheel. 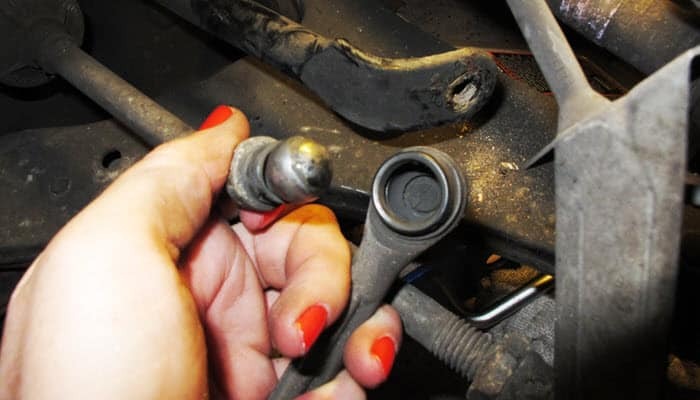 Tire rods are an important part of the system since they connect the steering arm to the steering rack. They also connect tire direction with the turn of the steering wheel. This lets drivers have control over their vehicles. So, the tie rods definitely need to be checked if you hear clunking noises. The sway bar link or anti-roll bar is responsible for reducing body roll when cornering or turning. It also keeps your car’s balance to prevent it from rolling over when making a sharp turn. If your car has been difficult to manage lately, you may want your sway bar link fixed. Ball joints are the parts that connect the wheel hubs to the rest of the suspension parts. They need lubrication to prevent them from getting dry. They start making noises once they become dry. 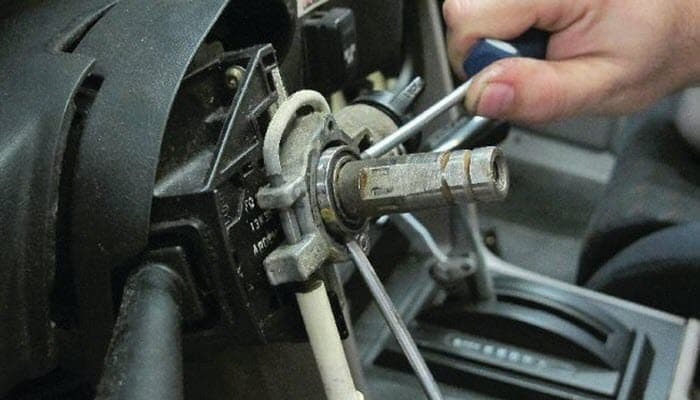 A shaky steering wheel is also the result of dry ball joints. Jounce bushing controls movement in the joints, absorbs road bumps and reduces noise and vibration. It’s often placed on top of a front strut. When it wears out, it allows more movement so there’s a slight shimmy from the front of the car. Rattling or clunking noises can also be heard, as well as loose steering or poor handling. A power steering rack serves as a pump to supply hydraulic fluid to the steering rack when you turn the wheel. This allows you to turn the steering rack with ease. If it wears out, hydraulic acid will start to leak which results in difficult steering. There can also be soft, whining sounds that are recognizable especially when driving at low speeds. Shocks keep a vehicle from bouncing. Strut, on the other hand, is where spring is mounted to maintain the height of your car. Though they last a long time, they eventually wear down and make noises when turning. When not replaced, your vehicle will feel bouncy when you make a turn. Think of steering column bearing as the body’s spinal column. Its ends are connected to the steering gear assembly and steering wheel. It provides a cushion to ensure that the two parts last longer for a smoother and less stressful drive. Turning becomes difficult when it wears down. It also comes with strange noises which means your car probably needs some checking. Power steering fluid lets you turn the big, heavy wheels of your vehicle easily. It is stored in a tank with a filter inside to make sure the fluid that enters your car stays clean. If you hear moaning or whining noises when turning, it can mean your tank is clogged. See a mechanic immediately to avoid expensive and more serious power steering problems. When your car makes noises when turning, the best solution is to go to an auto repair shop. The mechanics can tell you what needs to be fixed or replaced to bring your driving back to normal.